Located about 40 miles north of the town of Randsburg, California is one of the richest gold mining areas in southern California. It is located roughly 40 miles northeast of Mohave and has been the chief source of gold in the western part of Kern County and eastern part of San Bernardino County. This rich area has been mined for almost 150 years now, and is known for the many gold and silver discoveries that have been made there. The first prospectors in this area were likely the Spaniards many centuries ago, but the first real interest in this area started around the 1860s. The most major discoveries at Randsburg were made after placer gold was found in 1893 along the Goler Wash area northwest of Randsburg in the El Paso Mountains. This was primarily a placer mining area, which led to many lode discoveries in the nearby mountains. The end of the 19th century saw many large gold mines developed in this region, the largest of which was the famous Yellow Aster mine just south of Randsburg. There are literally thousands of small mines and prospects scattered around this area, mainly around the towns of Randsburg, Johannesburg, Red Mountain, and Atolia. Over the past century, this area produced a large amount of gold and silver on a major scale up through the early days of World War 2. However, the output of gold has dropped considerably since that time. Current estimates are that $20 million worth of gold has been mined from the area in total, but as with so many of the early mining districts, the estimates of production are quite incomplete and somewhat speculative. The small-scale miners that worked this area for many years likely produced some considerable gold that was never reported. The geology of the area is well suited for gold, but the arid climate made extraction of gold very difficult. The extremely hot summers in this area also limited gold production to a large extent. Drywashers were commonly used to mine the placer gold deposits found throughout the Randsburg area. In more recent years, this part of California has been very well suited for prospectors looking for gold with a metal detector. The largest gold nugget to have been found in the region was found with a metal detector. It became known as the Mojave Gold Nugget, and weighed in at a remarkable 156 troy ounces! The source of this massive nugget is likely from the many quartz veins in the area. Although this is believed to be the largest nugget found within the Randsburg mining district, many other large nuggets have been found by metal detectors and drywashers as well. Today, there are still mining operations going on in this region which still produces gold, silver and other valuable minerals, although not nearly in the number that was mined in the early 20th century. For those who want to engage in a little gold prospecting, this is an interesting and perhaps even profitable area to start. Due to its relatively close proximity to the highly populated areas in southern California, the Randsburg area does get quite a bit of pressure from prospectors. However, that certainly does not mean that all of the gold is gone, not by a long shot! 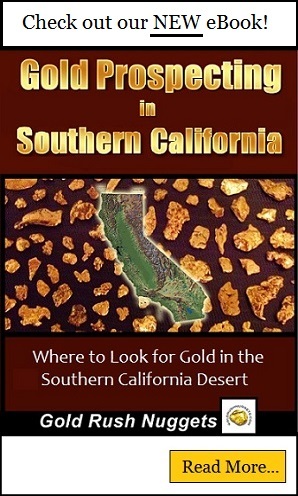 There is still a lot of good gold being found in this part of California each and every year.